This entry was posted in Faculty Blog, Relevance of Humanities, Religion in Culture and tagged historicize, Malory Nye, Method & Theory, Normalize, Peter Berger, Rite of Passage, Syllabus, theory, Theory of Religion by Russell McCutcheon. Bookmark the permalink. Yes, I agree there is a lot of structural insecurity for the continuance of an approach in the study of religion which engages with what is now well established in other areas of the humanities. 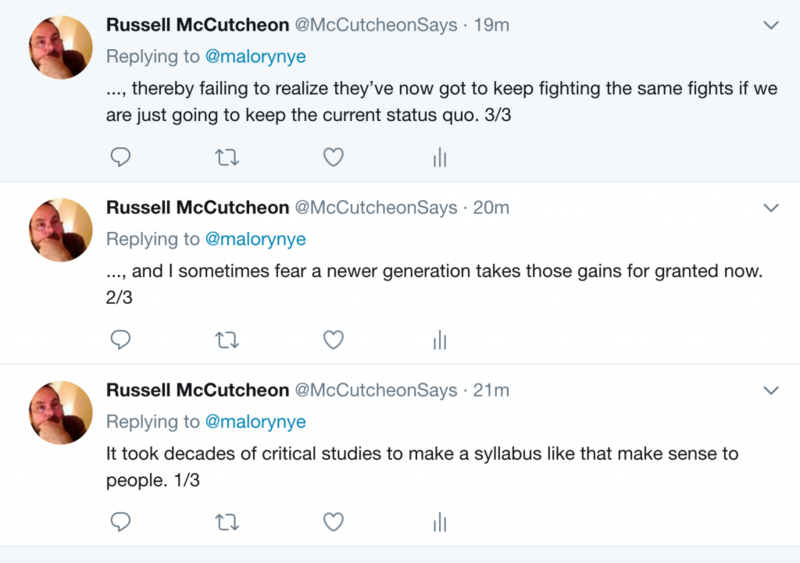 Of course an important part of this is the widespread casualisatuon/adjunctification of the generation who see the need to take up the baton. And my decision to make my syllabus open access in this way is to help/engage with colleagues who may share parts of this approach (or are curious to do do). It is one way in which a contemporary cultural study of religion can be taught.